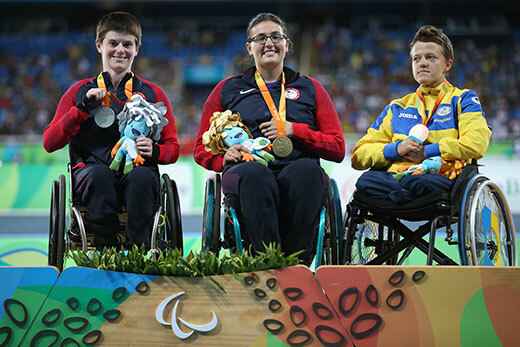 Silver medalist Cassie Mitchell (left) of the United States, gold medalist Rachael Morrison of the United States and bronze medalist Zoia Ovsii of Ukraine pose on the podium at the medal ceremony for Women's Discus Throw at the Rio 2016 Paralympic Games. Photo by Friedemann Vogel/Getty Images. Two-time Paralympian Cassie Mitchell has claimed both a silver medal in the Women’s F51-52 Discus and a bronze medal in the Women’s F51 Club throwing events in the 2016 Rio Paralympic Games. An internationally decorated athlete in the T51 class, Mitchell 04G 09PhD qualified earlier this year to join some 5,600 competitors at the 2016 Paralympic Games in Rio de Janeiro, where she was favored to medal in the throwing events. Mitchell, a research professor in biomedical engineering at the Wallace H. Coulter Department of Biomedical Engineering, a partnership between Georgia Tech and Emory, won medals in both events. She secured her bronze medal on Sunday in the club throw, with a personal-best throw of 21.84 meters, followed on Wednesday by a silver medal in the discus, with a personal-best throw of 12.87 meters. After originally being named to the USA Paralympic Track & Field Team, Mitchell learned shortly before the start of the games that she was also being added to the USA Paralympic Swim Team. The addition was due to a re-allocation of 267 Russian slots following an investigation into the country's state-sponsored doping program, and her 50m backstroke times were strong. According to Mitchell, she is one of only three Team USA athletes and one of eight overall athletes at the 2016 Paralympic games to compete in two different sports. While the last-minute change came as a surprise, Mitchell was optimistic about her chances. Swimming has long been a component of her cross-training, and she’s competed in it on a national level over the past two years. At the same time, Mitchell knew that the highly aerobic event would present a challenge — this spring, she was diagnosed with chronic myeloid leukemia, a form of cancer based in certain blood-forming cells of the bone marrow. For someone who has spent a lifetime adapting to health hurdles, the news meant yet one more critical adjustment. Working with Dr. Vamsi Kota at Emory’s Winship Cancer Institute, she elected to balance her ongoing athletic training with her cancer care. “I told Dr. Kota that it was his job to tell me if I was pushing myself too far, and he was definitely very supportive,” Mitchell says. Despite flagging red blood cell counts due to her recent struggle with cancer, Mitchell competed Thursday in the Women’s S2 50 meter backstroke. And while she did not medal, Mitchell did come away knowing more about how her body performs under a new kind of stress. “I made it out of the Rio 2016 Paralympic Games pool — barely — although I don't remember it,” Mitchell explained in a recent email. “The beginning of the race was great, but then I ran out of blood cells and oxygen, resulting in a hypoxic state — leukemia does that,” she explained. In the meantime, MitchelI expressed gratitude for the opportunity to compete in two sports in the same Paralympic Games — a rare feat — and celebrates her silver and bronze medals. “I feel very blessed,” she said. This marks Mitchell’s second appearance at the Paralympic Games. Her appearance at the London 2012 Paralympics brought a fourth-place finish, which only whetted her appetite to make it onto the medal stand this time around. Over the past four years, she’s become a world-record holder in the women’s shot put, as well as the T51 100-meter, 200-meter, and 400-meter wheelchair races. She also holds several American records. To learn more about the Paralympics and review event standings, visit here.